TJ Alas celebrates with teammates after hitting a homerun. Alas hit two homeruns on the day. 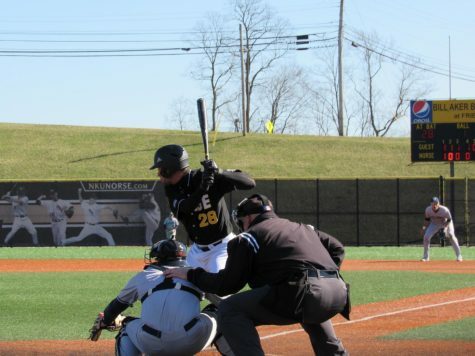 HIGHLAND HEIGHTS, KY- The NKU Norse defeated the Miami Hamilton Harriers 15-1 today at the Bill Aker Baseball Complex. 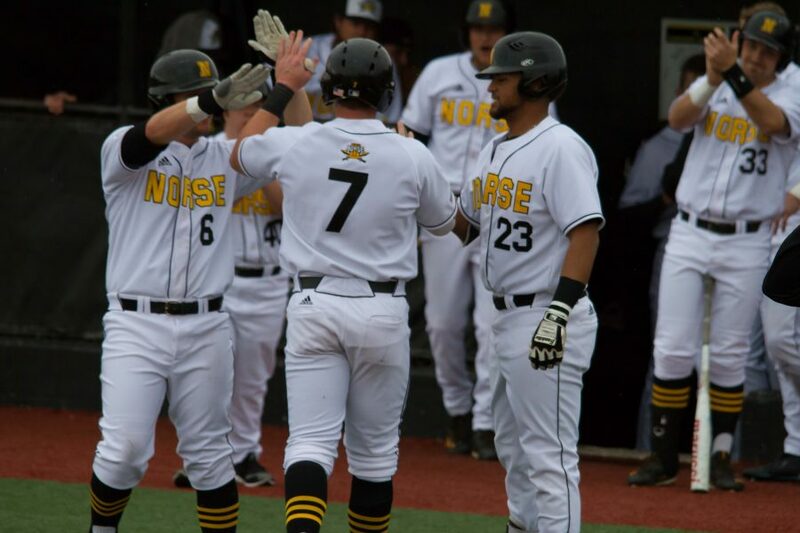 The Norse improve to 12-19 on the season while the Harriers fall to 20-17 on the season. 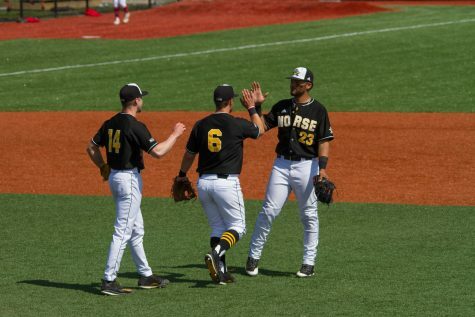 The Norse offense took no time to warm up, as senior TJ Alas started things off with a single, and with walks before and after him, NKU was able to load the bases. 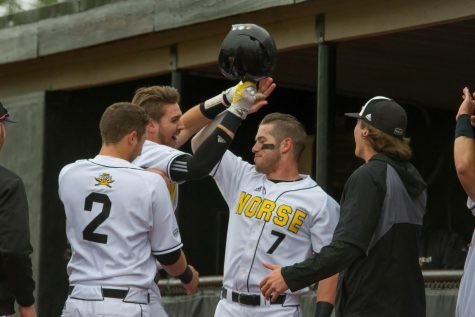 After two fielder’s’ choice plays both at home plate, Dominic Mercurio was able to score the Norse first run. 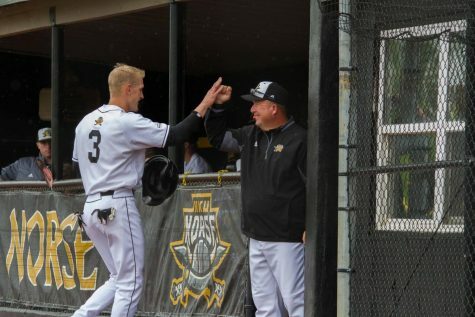 A single for freshman Preston Pilat allowed two more runs to score, putting the Norse up 3-0. 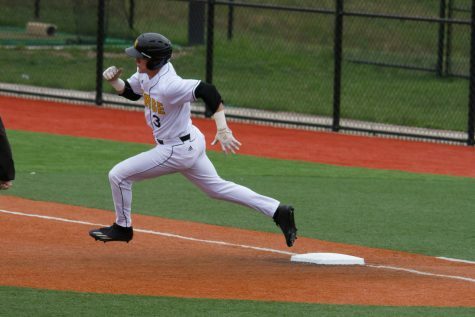 In the second inning, sophomore Billy Marion was able to quickly move around the diamond, and eventually score along with Conor Ledger to put the Norse up 5-1. The Harriers scored their only run of the game in the top of the third, after lead off hitter Ryan Ziels singles hard to third baseman Shane Paradis, who was able to make the stop but not in time to retire Ziels at first. He would go on to score later in the inning. Hits from Ledger, Alas and Mercurio allowed two more runs to score, making the score 7-1. Hits from Mercurio and Paradis scored another run late in the sixth, giving the Norse a 8-1 lead. 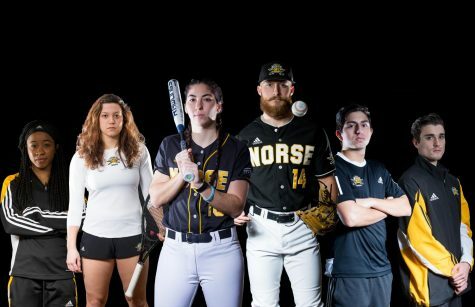 A three run seventh inning put the Norse up 11-1 going into their last time at the plate, and they went out with a bang. 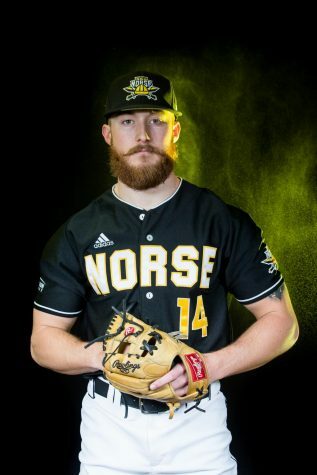 Paradis earned his third hit of the night, and Hemming brought him around with a two run homer, putting the Norse up 13-1. A series of hits, walks and a sacrifice fly from Will Haueter helped push their lead to 15-1. Head coach Todd Asalon was impressed with the way his younger players performed. 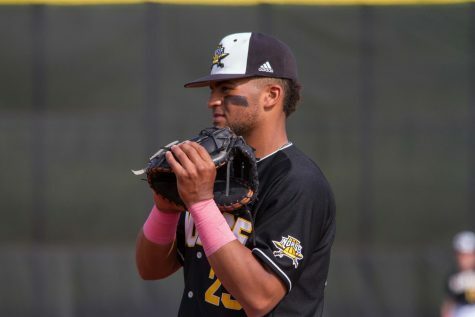 Junior Trey Ganns, who was named Collegiate Baseball’s National Player of the Week, went 2-4 at the plate and scored a run for the Norse. 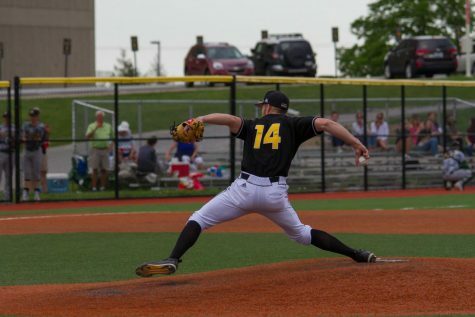 “It’s always cool to get recognized for your performance… but on a national level I found its a really cool and humbling experience,” Ganns said. Ganns says his relaxed style of play is what keeps him so successful.